The food in Harar was too amazing not to write about. So, I feel it is my duty as a food lover to share some of the delicious dishes and snacks I discovered there, for anyone else heading there too. The walled city of Harar is in the East of Ethiopia, a UNESCO World Hertiage Site a street food lovers’ paradise and generally one of the best places I’ve visited. Ever. The people are very friendly, streets colourful and culture diverse; Yemeni, Afghani, Egyptian, Turkish, Indian and West African countries have been trading there for centuries. Up until 1855 Turkey and Egypt both had Kings stationed in the city. The city has also been a major religious hub, it is the 4th Muslim holy city (after Medina, Mecca and Jerusalem) and the first Islamic centre in East Africa. The massive Brucey Bonus of all this diversity is a delicious and cheap array of food, some of which you can’t get in any other parts of the country. The streets are full of women and boys selling a range of chips, sambusas(not the shot, thank god), doughnuts, falafels and other deep-fried delights. These are good, but not amazing. The real gems are in the cafes and shops tucked down alleyways or up high-rise buildings. Luckily, Cass and I had an expert insider and fellow foodie Solomon, to show us what the really tasty grub was and where to get it. Oh, and when – there’s a specific time for when to eat everything in Harar. Sambusas are an Arabian twist on the Indian samosa and the falafels are a clear sign of the Turkish influence in the city. Whilst there are a ton of street food places in Harar you can get both, the best place to go is the Nebeya Ali’s shop, which she has been running for more than 14 years with her sister Zayida. They’re freshly made, the sambusas are filled with goat meat and both come with a green pepper dipping sauce. When to eat it: Open all day, but most popular after school and on market days (Monday and Thursday. This camel-meat bonanza of a dish originates from Somalia and can be found in the nearby town of Babille where there’s a big camel market two days a week. The dish consists of roasted camel meat, camel-hump fat, soup made from camel stock and spices, aromatic rice and a spice mix called kondo that’s made of black sesame. It’s a hearty meal – one portion is more than enough for three people (we couldn’t finish ours). Wash it down with a cup of Cha,a type of tea made with camel milk, and Gordon Ramsey style you’ll be able to say “Camel. DONE”. Location: Ali Restaurant, on the High Road in Babille, heading in the direction of Somalia. This dish is typical Harari dish. It is goat meat,that is cooked by being steamed very slowly overnight in a big pot made from termite soil (chosen because it can withstand high temperatures). The succulent meat is then eaten with a spicy dipping sauce made from tamarind, lime, water and berbere. It’s delicious and extremely popular with the locals – three whole goats are gone in one and a half hours. Ful (fava, or broad, bean) originates from Yemen and is a popular breakfast dish. 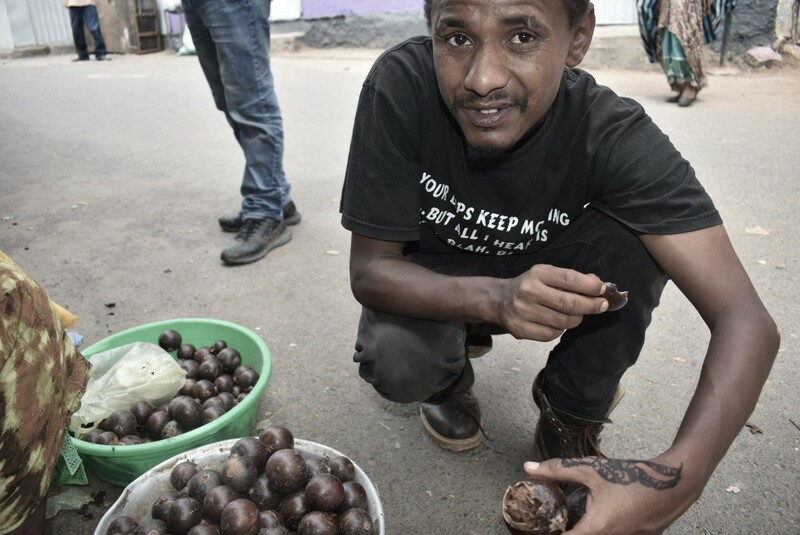 Whilst it can be found all over Ethiopia, the Harari version is unique because all the ingredients come separately in the bowl and are mixed together by the lucky customer. What makes the ful at Abadir’s so special is the basket of cobble bread fresh from the bakery around the corner, and their spiced tea. Oh, and their homemade yoghurt, which is just like my Mum used to make. Heaven. This is another popular street food dish that can be found all over Ethiopia, but is espeially popular and delicious in Harar. It is a thin pancake-style-bread that is then layered with omelette, tomatoes, onions, garlic and green chilli. The omelette mix is cooked within the pancake over hot coals. It’s great for a simple and cheap supper. Choose how many eggs you want depending on your appetite and either get it chopped or scrambled. I tried both (on different occasions!!) and reckon chopped just beats scrambled to the post. Another thing the city is big into are sweets – a whole range of halava, baclava, mushabak and other nutty, syrupy, cinnamony morsels from the Arab world can be found in most of the little ‘newsagents’ around the city, or from street sellers around the markets in the Old Town – keep your eyes peeled. Location: Most newsagents, but ‘Abey Shop’ definitely does. This shop is on your left about a third of the way down the road as you’re walking from the Main Gate in the direction of Feres Megala Square. For the best baclava, head to a newsagent in the New Town, behind Kim Café and near to Canal Café. Other things to try when you’re in Harar is dulet (tripe – most butcher-come-bars will have this when they’re not fasting), habesh wat, which is fenugreek curry and the ultimate in Harari home-cooking, and another street food of boiled potatoes and cabbage which can be found around the chat market (the woman wasn’t there when I went searching so can’t vouch for it). And one final thing, there is no such thing as faranje (foreigner) price, everyone pays the same regardless of whether you’re a tourist or local. So don’t embarrass yourself by trying to haggle them down. If you’re thinking of going to Harar then I can’t recommend enough getting in touch with Solomon, he is great and has even met Bob Geldoff. Contact details are: rasroot12@yahoo.co.ukor 0936052727 (phone is preferable to email as internet is patchy).